Welcome to A Sampling Bee! Today, I share with you a yummy syrup! 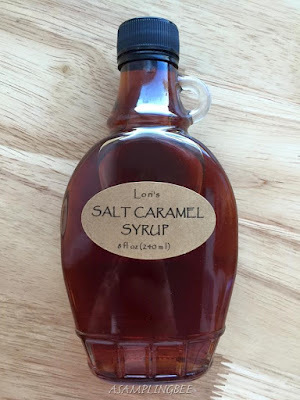 Introducing Lori's Salt Caramel Syrup! 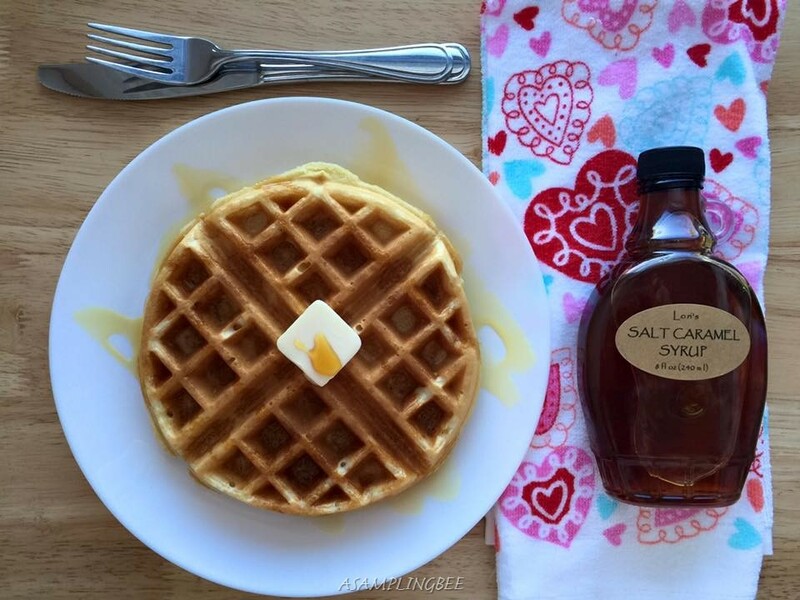 Add this delicious syrup to your pancakes, French toast or waffles! You can even add a little drizzle to your morning oatmeal. Yum! Kiss those fake syrups good-bye! This syrup contains only four, all-natural ingredients. Ingredients include caramelized cane sugar, Tahitian Vanilla, GMO-free Boyajian maple and French Celtic sea salt hand-harvested from the Bay of Biscay. Lori's Salt Caramel Syrup is made by The French Connection is Ashland, OR! Lori's Salt Caramel Syrup is Fat-free. I used Lori's Syrup on a batch of waffles. So so good! I could tell after one bite of my breakfast that this syrup is made with natural ingredients. I could really taste the vanilla and caramel. With a slight hint of maple. Even though this syrup is only made with 4 ingredients, the combination of the flavors make for one heck of a syrup. Nothing like I have ever tasted. 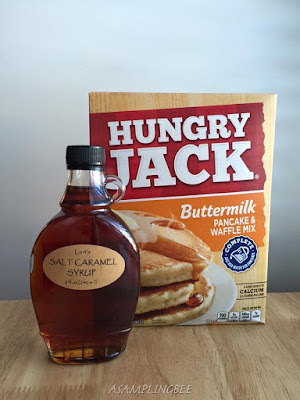 This syrup was a huge hit in my house. I am a lover of syrup and have to say that I recommend this one. It is so versatile. You can use Lori's syrup in Lattes or pour some on your favorite ice cream. 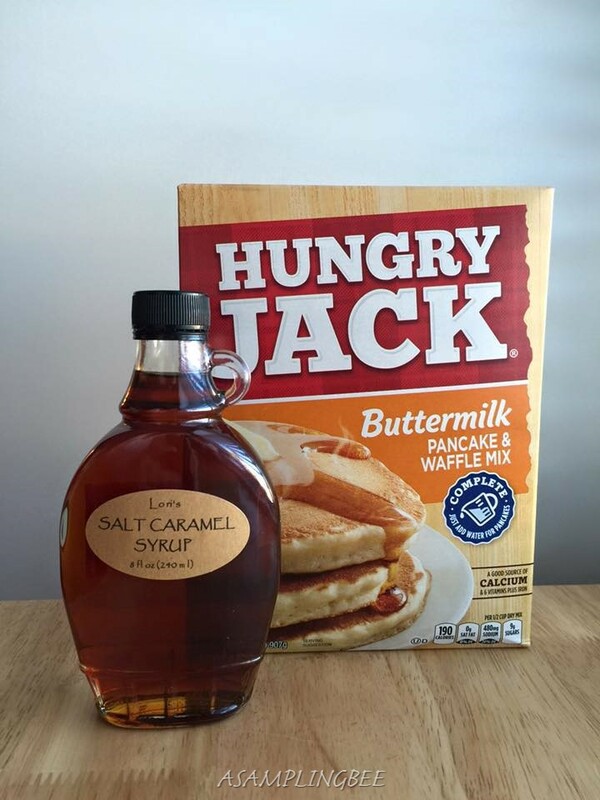 I look forward to making my husband and sons homemade pancakes and drizzling on some Salt Caramel Syrup! I am also looking forward to trying this syrup on top of some vanilla yogurt. I will be purchasing more of Lori's yummy Salt Caramel Syrup! One, 8 ounce bottle serves 16! I received a free bottle of Lori's Syrup to create my review. All opinions are my own. Always! Thanks, Lori! I would LOVE that. I need to get myself a bottle. It sounds awesome. I am a fan by looks alone! I know so many people that would absolutely die for this stuff. Salted caramel most of my friends love. I'd love to try this with some homemade waffles. Yum! We make breakfast for dinner a lot! That looks and sounds awesome! I love caramel! Good to know that it's made with natural ingredients and that it also tastes great! Love this syrup. Looks really delicious! This is such a great idea! It would be a nice change to the regular syrup we use. I went to college in VT so I'm a bit of a syrup snob :) I'd love to try this! This sounds awesome. I have to get me a bottle. I bet this is yummy. That's a delicious looking waffle. I'd love to try they syrup here. Listen girl, syrup is the morning essential. I'll definitely have to look up this one! I love breakfast any time of the day! This syrup sounds really good. Oh I would love that on my pancake every breakfast! Kung Fu Panda 3 Giveaway!! Malibu Beach Beauty Tea Review & Giveaway!